It’s almost March 1st, which means that it is almost time to re-set your annual calendars! To help get you in the spirit, today we will compare two Patek Philippe annual calendar watches: the ref. 5035 and the ref. 5146. 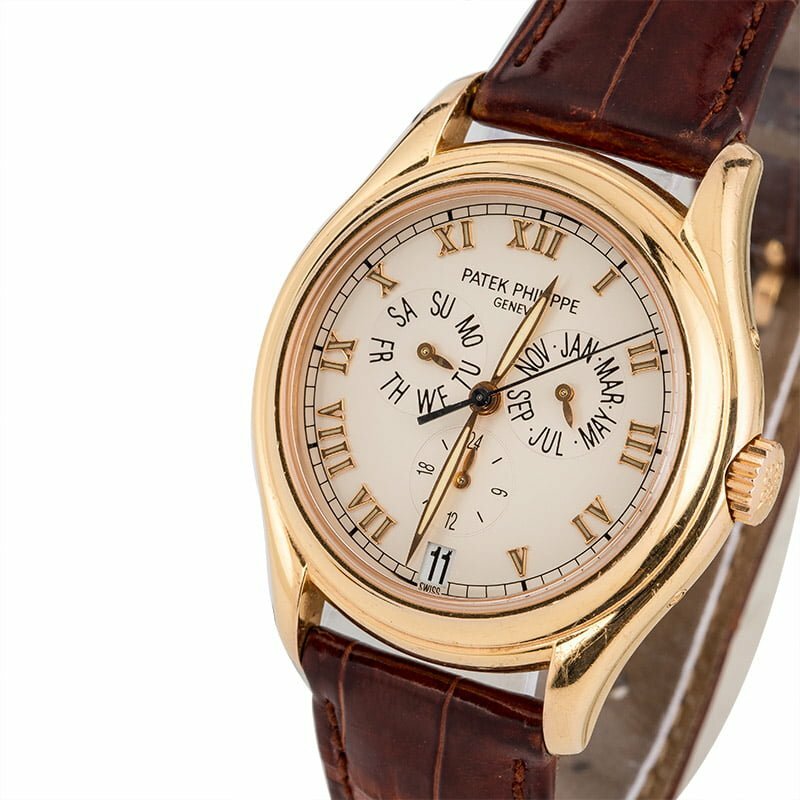 Among Patek’s plethora of watch complications, the annual calendar is one of the brand’s most popular. However, it may come as a surprise to some that the annual calendar complication is relatively young, at a little over two decades old (compared to the oldest known perpetual calendar made by Thomas Mudge in 1762). 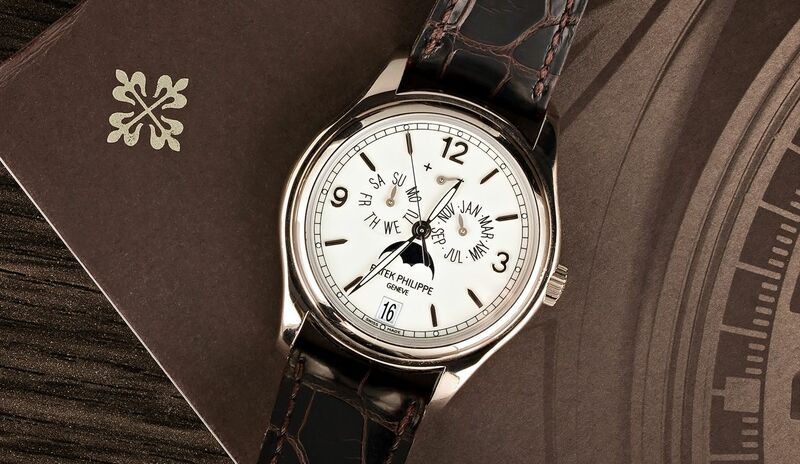 Patek Philippe launched the world’s first annual calendar in 1996 with the ref. 5035 and followed it up with the ref. 5146 in 2005. Here’s a closer look at two Patek Philippe annual calendar wristwatches: the 5035 vs. 5146. Patek Philippe Annual Calendar ref. 5146. But first, What Is An Annual Calendar? Calendar watches come in many forms. For instance, there are the simple date watches and the slightly more complex, day and date watches. Then there are complicated calendar watches that can indicate day, date, month, and moon phase. And among those, there are perpetual calendar and annual calendar watches. A perpetual calendar watch automatically adjusts to correctly indicate the date in (almost) perpetuity because the complication accounts for leap years too. However, in 2100, the scheduled leap year is skipped, so even a perpetual calendar will require manual adjusting – but none of us will be alive then, so that is not our concern! On the other hand, an annual calendar needs a hands-on correction once a year. An annual calendar can differentiate between months with 30 days and 31 days, but not for February, which has either 28 days (in a normal year) or 29 days (in a leap year). Therefore, every year, when February turns into March, the wearer has to manually adjust the calendar to continue on the correct course. The ref. 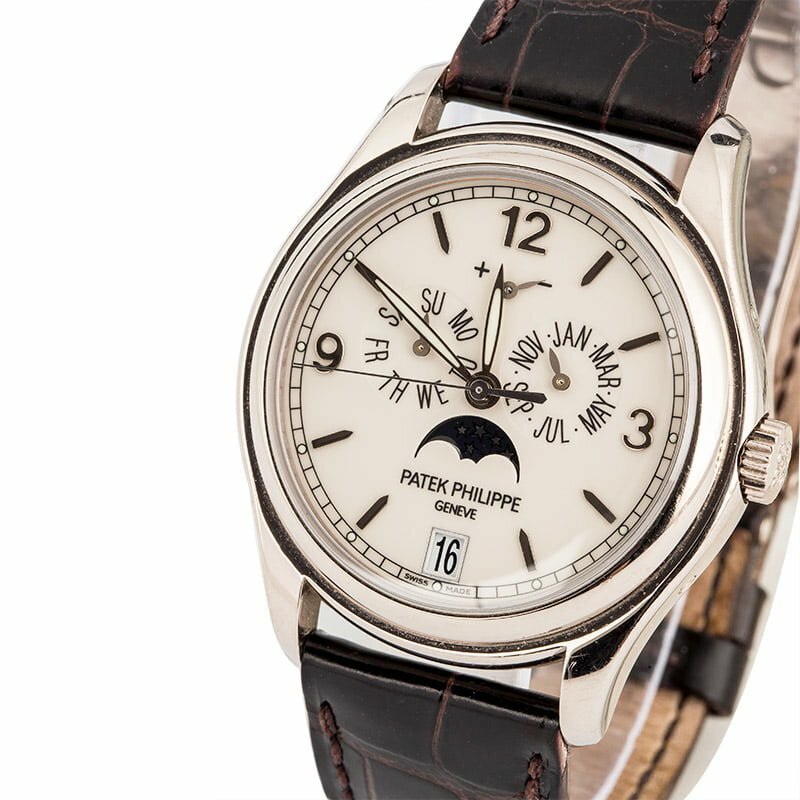 5035 was Patek Philippe’s first annual calendar watch. As previously mentioned, the first generation Patek Philippe Annual Calendar ref. 5035 made its debut in 1996. Available in yellow gold, rose gold, white gold, and platinum, the Patek 5035 sports a 37mm round case with a smooth stepped bezel. As expected, these dressier Patek watches come fitted with elegant leather straps. The dials (available in black, white, silver – or in rare cases, blue or salmon) of the Annual Calendar 5035 pack plenty of information. At the center are the luminescent leaf-shaped hands that sweep around the dial, pointing to the luminescent Roman numerals. Then there’s the trio of sub-dials to indicate the month, 24-hour time, and day. Finally, there’s a discreet date window placed at 6 o’clock. As with most modern Patek Philippe watches, the back is fitted with sapphire crystal for a clear view of the movement inside. In this case, the engine is the automatic Caliber 315/198, which offers users a power reserve of roughly 40 – 45 hours. The ref. 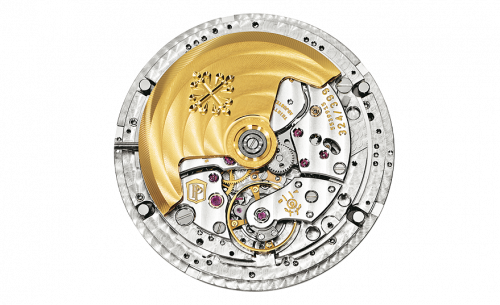 5146 is the second (and current) generation of Patek Philippe annual calendar watches. In 2005, Patek replaced the ref. 5035 with the Annual Calendar ref. 5146. With the second generation (and current) Annual Calendar, Patek brought about a host of changes. First, the case size grew to 39mm – more fitting to the market demand for larger men’s watches. Yet again, the 5146 is available in yellow gold, white gold, rose gold, and platinum. However, along with leather strap options, Patek now also offers all three gold editions with a full gold link bracelet. In addition to design changes, the Annual Calendar ref. 5146 also offers even more displays on the dial. Along with the time, date, day, and month, the current Patek annual calendar model also has a moonphase display (forgoing the 24-hour sub-dial) and a power reserve indicator. The lume-filled Roman numerals of the older model were replaced with a mix of Arabic and faceted indexes, accompanied by small lume plots on the outer railroad minute track. Conversely, the platinum version only has faceted indices, and has no numerals at all for its hour markers. In terms of movements, the earlier Annual Calendar ref. 5146 watches ran on Caliber 315/299 operating at 21,600 beats per hour. This was later replaced with the current Caliber 324 S IRM QA LU, which operates at 28,800 beats per hour. The 5146 watches also come with a sapphire caseback and those with the updated movement offer users a power reserve of approximately 45 hours. The Caliber 324 S IRM QA LU movement from inside a ref. 5146 Patek Philippe annual calendar watch. Regardless of which version of the Patek Philippe Annual Calendar reference you opt for, these watches represent a significant milestone in the brand’s long and storied history. It is not often that we see completely new inventions in modern horology. These complex fine timepieces by Patek clearly illustrate that you’re never too old to innovate.